Home» AP GO's » AP Compassionate appointment dependents deceased employees as per G.o.No: 10. 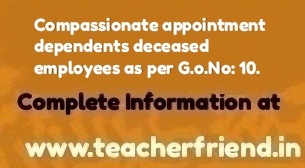 AP Compassionate appointment dependents deceased employees as per G.o.No: 10. Govt., Memo.No.766/Ser.IV-1/94-2,Edn (Ser.IV) Deptt.,dated 18.05.1995. Govt., Memo.No.1366/Ser.IV-1/94-2,Edn (Ser.IV)Deptt., dated 04.07.1997. Govt., Memo.No.20360/SE.PS1/ A1/2010, dated 09.06.2010.
employees, in the G.O third read above; the scheme of compassionate appointments was extended to the employees working in Aided/ZPP/Municipal Management Schools. appointments only in that School. Subsequently, in the Memo. Sixth read above, Government imposed ban on creation/filling up of existing vacancies of aided posts in the recognized Aided Schools and also issued orders that the ban orders are applicable for the appointments on compassionate grounds in the Aided Schools vide Memo. seventh read above. In the G.O. eighth read above, Government have revived the scheme of compassionate appointment to the dependents of the deceased aided employees working in the aided institutions in terms of G.O.Ms.No.30, Education (Ser.V) Department dated 01.02.1994, by taking district as a Unit and providing them employment in ZP/MPP/ Government Offices (Not in aided institutions).However, Government have clarified that the orders issued in the Memo. ninth read above are with effect from the date of issue of G.O., i.e w.e.f 06.10.2009 (prospective) only. immediately. These instructions should be followed scrupulously and any instructions issued by any other Department are repugnant to these instructions, the instructions issued by this Department will prevail over the instructions issued by any other department. above completely, with immediate effect, vide G.O. eleventh read above. to compassionate appointment shall apply. The Commissioner of School Education, A.P, Ibrahimpatnam, shall take necessary action accordingly and to take appropriate action for withdrawal of the Writ Petitions/Writ Appeals/SLPs etc., if any filed on the above subject matter. my father is working as a headmaster in Mandal parishad primary school. He will retire on December 2019. Now he is deceased(he is physically and mentally unfit to continue his duties). can i get that job under compassionate appointment.